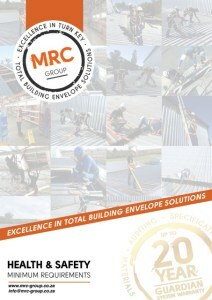 It has become evident to MRC Group in recent times, that many of our clients are not familiar with the Occupational Health Safety Act No 85 of 1993 and its associated regulations and standards and in particular the Construction Regulations 2014. In terms of section 43 of the Occupational Health Safety Act No 85 of 1993 the Construction Regulations were amended by Government Gazette notice R84 on 7 February 2014. The full implementation of the amendments came into force on 7 August 2015. The MRC Group approach is, that we engage with our client on Health and Safety from the outset of the project through to project completion.